Conflict is normal, especially when it involves documents, treaties, and agreements signed long ago by people who are no longer around to vouch for their validity or standing in a modern government or society. One such ongoing struggle surrounds the Treaty of Waitangi. When one asks about the meaning and the spirit behind the intention of the Treaty of Waitangi, which also happens to be New Zealand’s founding document, it often results in a lot of arguing and fierce debate. Over the years, violent conflict has transpired between settlers from Europe and the native Maori peoples. The treaty was signed and made office in 1840 and ever since that time there has been argument and debate over what the treaty actually meant, who is bound by it, and whether or not it is still to be upheld. 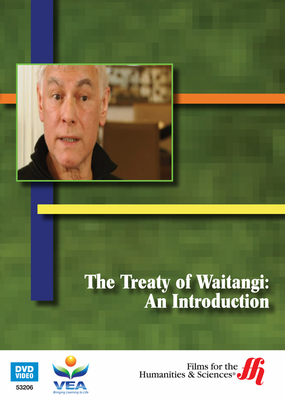 This education DVD and study set takes a closer look at the the events leading to the need for the Treaty of Waitangi, the time period, the seen and unforeseen consequences, how two different versions of the treaty came to be,what impact and value the treaty may still have the twentieth century, and much more! The series will serve as an excellent resource of study material for students interested in New Zealand, the time period, or political topics in general.